Thanks for visiting the official blog for The Benjamin Franklin Diet. 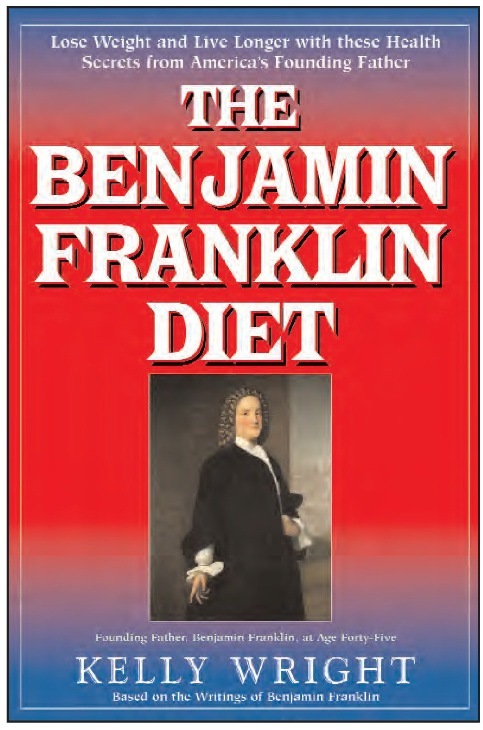 This new diet book reveals the secrets to healthy eating and living, based on the writings of Founding Father, Benjamin Franklin. My name is Kelly Wright and I’m the author of the book. I’d like to share with you how the diet was developed and how it has changed my life.The best way for me to explain how it came about is to share the following excerpt from the Introduction of the book. “This might sound odd, but I’m a big fan of Benjamin Franklin. It all started when I picked up a copy of Franklin’s autobiography in an airport many years ago. Believe it or not, the story of his life is a page-turner and I found myself reading it over and over again whenever I needed a lift or a little bit of inspiration in my life. I recently celebrated my fortieth birthday.Besides a few gray hairs, I noticed that I was gaining weight faster than I used to, and thatI had less energy. While I’ve never been obese, I was getting dangerously close to wearing plus-size clothing and my level of physical activity was almost nonexistent. The time had come for me to make some major changes in my life. But what was I to do? Like most people, I’d tried dieting and would lose the weight only to put it back on again. I didn’t want to go back on a low-carbohydrate diet, but what choice did I have? I’d lost up to thirty pounds doing this in the past and it was the best solution I had. Soon after this fortieth birthday, I put myself on a strict, low-carbohydrate diet. I lost five pounds within a couple of weeks. But as I dined on meat, cheese, fat, and artificial sweeteners, I noticed I had no energy and it seemed like the food I was eating was making me sick. This diet can’t be healthy, I thought, but I wasn’t really sure what I should be eating or how to go about achieving long-term good health. Here I was at forty years of age asking the same old question, what am I supposed to eat? That’s when Benjamin Franklin’s autobiography came to mind. I remembered that he had written various things about diet and nutrition. So once again, I picked up the book and took notes on every reference Franklin made to food, diet, nutrition, and exercise. Then I went through letters and other documents he’d written and did the same thing. I began implementing Franklin’s advice on what to eat and started to see immediate results. That was the moment I knew I’d stumbled onto something big. Benjamin Franklin lived twice as long as the average man of his time and enjoyed good health throughout the majority of his life, which he credited to his diet. But it wasn’t the typical colonial fare of red meat and ale that kept Franklin in good health; he developed his own diet which was quite different from what everyone else was eating in eighteenth century America. Unlike most people of the time, Franklin wasn’t gorging on wild game and alcohol. He was practicing a simple diet that consisted mainly of whole grains.A case can, in fact, be made that, besides this legendary polymath’s genes and his natural brilliance, Benjamin Franklin was able to do so many things so well because of his exceptional style of living. It was foundational. It didn’t weigh him down and, unlike many in his century, he wasn’t walking around in a stupor from excessively heavy meats and fats, not to mention intemperate alcohol consumption.Clearheaded, he had the energy to be all he strove to be. His eating and exercising habits were light-years ahead of his time; he subsisted very well on a diet that, 200 years later, is scientifically recognized as a boon to good health and longevity. When he passed away at eighty-four, his lifespan was almost twice that of his contemporaries who usually died from sickness and disease in their forties or fifties, victims of the debilitating diet of the time.Think what a ripple effect there would have been if Franklin hadn’t followed a sober diet and had been a drunk or died of disease at age forty-two like the average man. Just imagine that.Once I had pieced together the basic principles of Franklin’s diet, it was time to start developing the recipes. It wasn’t long before I came to the conclusion that our food today is drastically different from the food of Colonial America. We’ve got fast food and processed foods that are tainted with pesticides, herbicides, chemicals, artificial sweeteners, hormones, and God only knows what else. Knowing that today’s run-of-the mill food wasn’t going to cut it, I began another research project to find out exactly what foods were available in the eighteenth century and how they were prepared. Then I set out to recreate Franklin’s healthy diet for today’s world.My research for The Benjamin Franklin Diet has been a cross-country adventure. Over the space of a recent summer, I took myself on a self-guided tour of eighteenth-century taverns, which was something like traveling back through time. I sat in real taverns in the original colonies, sampling authentic cuisine, and I haunted the dusty aisles of rare bookshops in search of long-forgotten cookbooks. Eventually I came home and put on my apron. Armed with a few kitchen utensils and a stack of colonial cookbooks written in ye olde English, I spent months in the kitchen testing authentic eighteenth-century recipes, which were more like guidelines than actual instructions. But after hundreds of test batches, I developed over fifty authentic colonial recipes to go along with Franklin’s dietary recommendations.Throughout my research, I ate nothing but my test recipes and lost all the excess weight I’d packed on over the previous years. After a few months of following Benjamin Franklin’s diet, I was as thin as I’d been in high school and had never felt better in my life. It was more than just a diet for me. I had stumbled onto a whole new way of living. As a bonus, I discovered that each of Benjamin Franklin’s recommendations about nutrition had been scientifically proven through contemporary clinical research studies. Every time I came across a new reference on food, I would check it against medical studies and was able to verify that his recommendations are in alignment with today’s research on healthy eating.Besides changing my diet, I began following Franklin’s exercise advice and found myself growing stronger every day. I had an incredible amount of energy, so much so that my dogs had a hard time keeping up with me on our daily walks.